After retiring from professional chess in 2005, Kasparov devoted his time to the Russian pro-democracy movement. He was named chairman of the Human Rights Foundation based in New York in 2012. He moved from Moscow to New York City the following year where he continued to work with the Kasparov Chess Foundation. Outside of his work as chess Grandmaster, humanitarian, and speaker, Kasparov has dedicated his time to writing. Starting in 1991, he began contributing commentary on politics and human rights to The Wall Street Journal. His works cover topics ranging from chess to strategy to current events. If you are interested in chess as a player or as a book collector, we've compiled a few of Kasparov's important works. These titles will get you started learning or with your collection. In this book, published in 2001, Kasparov uses lessons and strategies he learned playing chess to help readers with decision making. He discusses strategy, evaluation, preparation, memory, imagination, and instinct by sharing analysis of the matches he played throughout his career and other examples from history, literature, and politics. Kasparov shares both his failures and his triumphs, allowing readers to learn from his success as well as his mistakes. 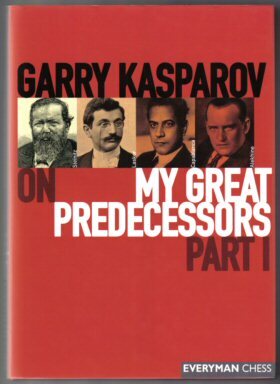 This five-volume series provides background and biography for world chess champions before Kasparov. The first volume begins with information on the unofficial champions before 1886, focusing mainly on Adolf Anderson and Paul Morphy, and moves on to examine the first four official world champions. The second part discusses the fifth through the eight champions and the third volume looks at the ninth and tenth champions. The main focus of the fourth volume is Bobby Fischer, but it also discusses Western players who were not world champions. The final part examines the competition between Victor Korchnoi and Anatoly Karpov for the twelfth world champion. These books are exceptional for anyone who is interested in placing chess in a historical context. Kasparov explains nicely how each of the players brought his individual style to the chessboard and enriched the theory of the game with the unique ideas brought to the table. Similar to My Great Predecessors, Modern Chess follows chess developments from the 1970s and Kasparov’s matches. The first part examines the revolution in chess following Fischer, using complete games to exemplify Kasparov’s argument. The second part contains all of the matches played between Karpov and Kasparov through 1985, including the fight for World Champion, while the third section follows the pair’s matches through 1987. In the fourth part, Kasparov shares their matches from 1990 through 2009. Sources: Biography. (n.d.) Retrieved Feb. 23, 2019, here.